Sunflower Jam and earMUSIC are going to release the 2012 show on CD and DVD on March 2, 2015. Titled Paice’s Sunflower Superjam – Live At The Royal Albert Hall 2012, it will be available in CD+DVD and DVD+CD editions. As far as we’ve been able to ascertain, both will include the same content, the only difference being in packaging. 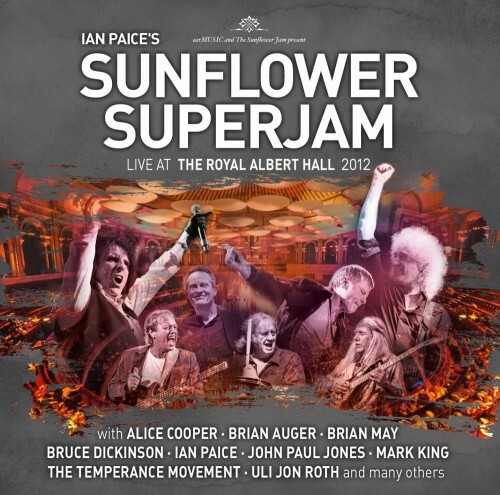 This Sunflower Jam was held at the Royal Albert Hall on September 16, 2012. It was the second time the RAH hosted the event. Before 2011 “the Jam” was held at smaller venues in a semi-private manner (read: you had to buy an expensive seat at a dinner table). This event was also held in the wake of Jon Lord’s passing, with the initial announcement made in March that year giving is a bit of hope about his treatment by billing his appearance at the event. Much of the material has been released last year on The Sunflower Superjam DVD (*), the tree bonus tracks and addition of the CD being the main draw here. Thanks to Chris Hewlett for the info. Posted by Nick Soveiko on Wednesday, December 17th, 2014, filed under News. You can follow comment on this post through the RSS 2.0 feed. You can skip to the end and leave a comment. Pinging is currently not allowed. Whoa…that looks like a winner. Wow!! It will be great!! Can’t wait to get this!! I have watched a few of these clips online. Probably the best Sunflower Jam IMHO! Cheers. It looks to me like the three bonus tracks on this version are actually already included on the Sunflower Superjam double DVD. They are the extra tracks on disc 2 after the 2011 concert. They should release the Sunflower Jam where Bernie Marsden and Robert Plant did a song.